New guidance launched today will support prescribing healthcare professionals to review inappropriate prescriptions for people under their care who have a learning disability and/or autism. 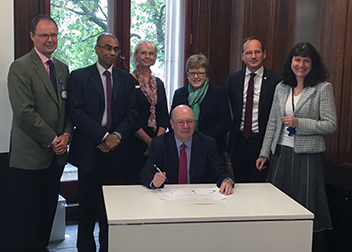 The toolkit comes as NHS England and Rt Hon Alistair Burt MP, Minister of State for Community and Social Care, joined forces with five professional bodies and the Challenging Behaviour Foundation (CBF) to pledge sustained action to tackle the over-prescribing of psychotropic drugs to people whose behaviour is challenging. Multiple psychotropic drug use often starts at a specialist level, which is then passed onto primary care for long-term management. Research published last year found that, in too many cases, these prescriptions are repeated without adequate review. An estimated 35,000 adults with a learning disability are being prescribed an antipsychotic, an antidepressant or both without appropriate clinical justification. Long-term use of these drugs can lead to significant weight gain, organ failure and, in some cases, death. 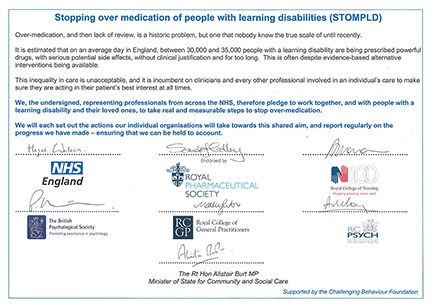 The Stopping Over-Medication of People with a Learning Disability (STOMPLD) pledge has been signed by the Roya l Colleges of Nursing, Psychiatrists and GPs, as well as the Royal Pharmaceutical Society, the British Psychological Society and NHS England at a summit in London today. It commits each to “work together, and with people with a learning disability and their loved ones, to take real and measurable steps to stop over-medication”, and is intended to mark the beginning of a series of actions by the signatories over the coming months. Dr Matt Hoghton, Medical Director for the RCGP Clinical Innovation and Research Centre, said: “Working collaboratively between healthcare professionals and carers is really important in tackling the appropriate use of psychotropic drugs in our patients with learning disabilities, and signing this pledge today is an important commitment to ensuring they receive the best possible care. Sandra Gidley, Royal Pharmaceutical Society English Board Chair, said: “For far too long people with learning disabilities have received poor health care. “This group of patients are frequently prescribed antidepressants, sedatives and mood stabilisers in order to manage episodes of ill-health or challenging behaviour, which are not subsequently reviewed. These medicines can cause serious side-effects, poor health and even premature death. Professor Peter Kinderman, President of the British Psychological Society, said: “Used appropriately and well supervised, these drugs can play an important role in helping people get through what can be really tough points in their lives and the lives of their families. Annie Norman, RCN Professional Lead for Learning Disabilities and Criminal justice said: “The RCN has repeatedly highlighted that people with learning disabilities are still being failed by the health care system. It is simply not acceptable that people with a learning disability are being prescribed anti-psychotic drugs without appropriate clinical justification. 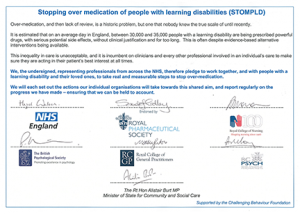 The STOMPLD Pledge was signed by the following organisations, and supported by the Challenging Behaviour Foundation. Over-medication, and then lack of review, is a historic problem, but one that nobody knew the true scale of until recently. It is estimated that on an average day in England, between 30,000 and 35,000 people with a learning disability are being prescribed powerful drugs, with serious potential side effects, without clinical justification and for too long. This is often despite evidence-based alternative interventions being available. This inequality in care is unacceptable, and it is incumbent on clinicians and every other professional involved in an individual’s care to ensure they are acting in their patient’s best interest at all times. We, the undersigned, representing professionals from across the NHS, therefore pledge to work together, and with people with a learning disability and their loved ones, to take real and measurable steps to stop over-medication. We will each set out the actions our individual organisations will take towards this shared aim, and report regularly on the progress we have made – ensuring that we can be held to account. In the population with intellectual/learning disabilities compared to the general population, the multi-morbidity burden is greater, occurs at much earlier age, and the profile of health conditions differs . People with intellectual disabilities use multiple medications and may have been taking them for many years. Extreme care in required when de- prescribing many medications in this population group. The principles of good de-prescribing during medication review in the population with intellectual/learning disabilities, based on the British Pharmacological Society’s Principles for Good Prescribing 2010, provide a template for quality de-prescribing in this population group. 10. De – prescribe within the limitations of your knowledge, skills and experience of the population with intellectual disabilities and behaviour disorders. About time! However, care home provider organisations should be asked to sign up to this pledge, as they are also amongst the administrators of prescribed medication. Maybe the CQC can consider how this plays into its registration and inspectorial work with the Sector? I am extremely concerned that the cut in central government funding to county councils for services for adults with learning disabilities will only make this problem immensely worse. Cuts in services will mean less support and stimulation leading to increased mental health problems. I am 100% sure that if you asked the parent of ANY learning disabled adult would that learning disabled person become withdrawn, depressed or worse if their day services or other support was significantly reduced or withdrawn, the parent would reply with a resounding YES!! Please help fight these cuts.